As announced at the Tampere Film Festival in Finland, the documentary short Lummikko (The Little Snow Animal) has been selected by the festival’s international jury for a nomination for the 23rd European Film Awards. 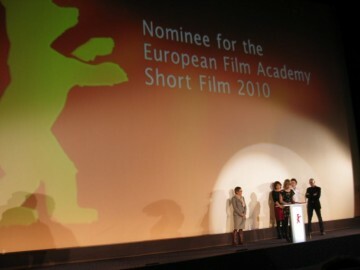 There are now seven short films already nominated for European Film Academy Short Film 2010, an award presented in co-operation with a network of festivals across Europe. In the Tampere short film nominee, a 16-year-old girl calls a radio night talk-show, telling the host about her miserable life. In a unique associative mixture of fiction, documentary, animated scenes and music, the film captures the inner universe of a troubled teenager struggling with the consequences of her deeds. The short film nominee selected at the Berlin International Film Festival deals with twelve-year-old Marie who has problems putting her childhood behind her. Ever since her young mother brought home a new boyfriend, Marie’s questions have gone unanswered and communication would seem to be impossible. Marie desperately tries to win back her mother for herself, at the same time seeking comfort in the world of her memories. Selected at the International Film Festival Rotterdam, this documentary short tells a gripping story about the experiences of children in an unreal-looking Pristina, the capital of Kosovo, told in an unorthodox way. The Ghent short film nominee is about a young man who makes a most untraditional living. In a city where young, rich people will spend whatever it takes to get what they want, Thomas provides them with a service no one else will. And loathes himself for doing it. In this comedy short, nominated at the Valladolid International Film Festival, a bored cop in the middle of nowhere wants to prove himself. He sets up traffic lights at a lonely bridge, messing up the villagers’ routine with his new rules. With dry slapstick, the film mildly pokes fun at the law. The Cork short film nominee is a charming and beautifully animated story about a shy, introverted little boy who collects snails. One day he gets swallowed up by his own belly-button and discovers the disturbing world of the ‘navel-gazers’- and with that the importance of others. The film displays exquisite technical control, whilst maintaining a delicate and human touch throughout. The Angers short film nominee is an authentic family drama about a single mother and her teen-aged daughter who doesn’t get along with her mother’s new lover. Their every day life is by fights and jealousy. Only in moments, when she her mother all to herself, the daughter feels safe and happy. Torn between her daughter’s needs and her own, the mother only sees one solution for herself to be happy again and makes a serious decision. Brilliantly acted and true in every little gesture, this drama is highly moving despite its brevity. The next three nominees will be presented in June in co-operation with the Krakow Film Festival (Poland), the Norwegian Short Film Festival Grimstad (Norway) and the Edinburgh International Film Festival (UK) respectively. When the annual cycle is completed in September, the nominees will be presented to the more than 2,000 members of the European Film Academy, who will select the overall winner, the European Film Academy Short Film 2010 which will be presented at the 23rd European Film Awards Ceremony on 4 December in Tallinn/Estonia.